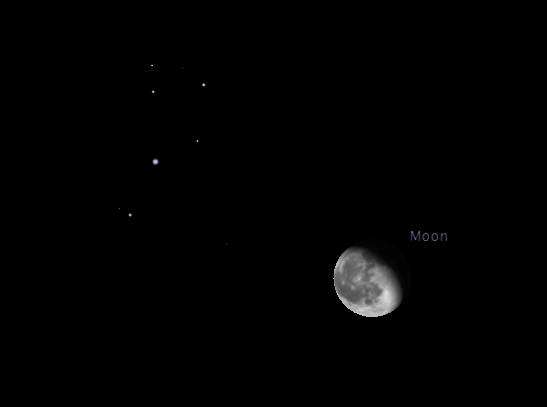 Tonight the Moon will be located near the Pleiades star cluster late this evening (from the western hemisphere). 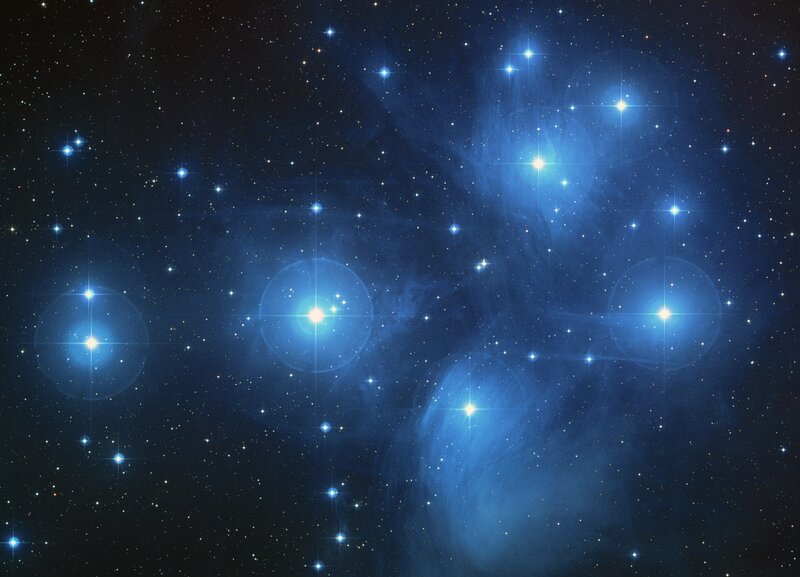 The Pleiades is a cluster of related stars which formed out of the same molecular cloud between 75 and 150 million years ago. The cluster is slowly moving apart and may fully disperse in 250 million years. The cluster is over 1000 member stars spread over a radius of 43 light-years with most members in a inner core 8 light-years across. The total mass of the system is estimated at 800 solar masses. The brightest star in the cluster is magnitude +2.9 with five other stars between +3.6 and +4.3. A seventh star is a variable and may have been brighter in the past (currently ~+5.1) hence why the cluster was known as the ‘Seven Sisters’ in ancient times. The brighter stars make sort of a ‘Little Dipper’ pattern and many people mistakenly think it is the Little Dipper. Under dark skies the Pleiades look like a small dipper shaped cluster of stars about 2 Moon diameters across. Under brighter skies, the cluster may appear a small fuzzy cloud. The Moon may be too bright to see much of the Pleiades with the naked eye so use binoculars to get a better view. Tomorrow – Day 21 – The Moon passes an even closer, bigger cluster.